Water Poppy is a deciduous, runner-forming aquatic perennial herb. It has shiny, thick, rounded, dark green leaves, 2-4 inches across, that typically float, but occasionally rise above the water surface. Leaves have heart-shaped bases. 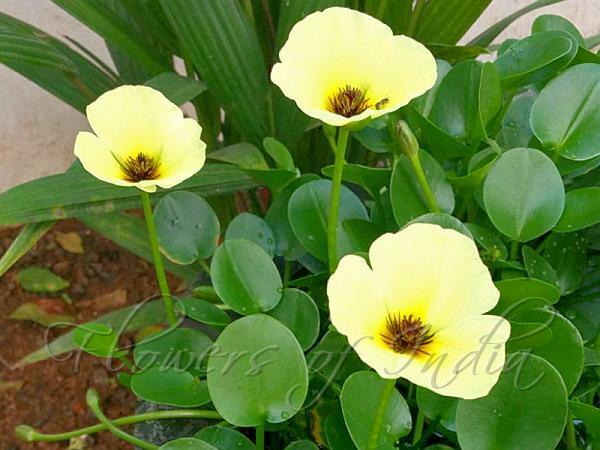 Flowers are 3-petaled, lemon-yellow, 5 cm across, with reddish-brown centers and numerous black or brown stamens. Flowers rise above the water surface. Flowers typically last only one day, but plants bloom in succession over a long summer period. Plants send out floating plant runners on the water surface that sprout new foliage and roots. Flowers are most frequently produced on the runners. Water Poppy is native to Central and South America, and is cultivated in parts of India. Identification credit: P.S. Ramanathan, P.S. Sivaprasad Photographed in home garden in Palakkad, Kerala.